Image of the Dualband slot-loaded pin-fed linearly polarised rectangular patch. 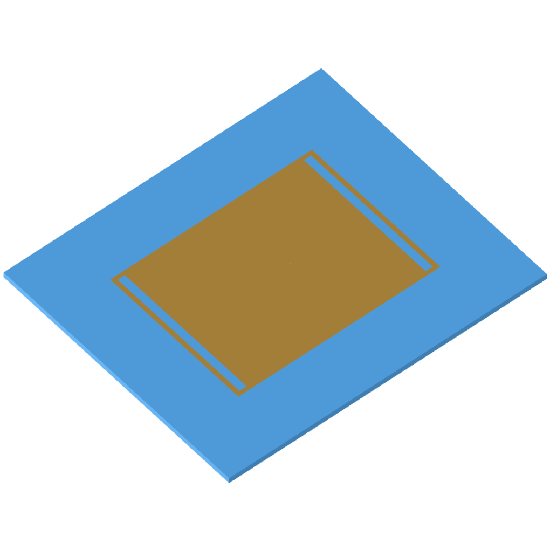 Patch antennas are popular for their well-known attractive features, such as low profile, light weight and compatibility with MMICs. Their main disadvantage is an intrinsic limitation in bandwidth, which is due to the resonant nature of the patch structure. Modern communication systems (GPS, vehicular, WLAN, etc. ), however, often require antennas with compactness and low-cost, thus rendering planar technology useful and sometimes unavoidable. Dual-frequency patch antennas provide an alternative to wideband planar antennas in applications where a wide bandwidth is used for operation at two separate transmit-receive bands. Dual-frequency operation is achieved by modifying the natural modes through slot-loading.